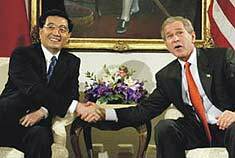 Unfortunately, President Bush doesn’t have these options available to him as Chinese President Hu Jintao visits Washington this week, but it won’t much matter. Anyone who thinks anything substantive comes out of Alpha Dog to Alpha Dog discussions, is hopelessly naïve. Those issues have already been fought over, chewed on, threatened about, pleaded, coerced and ultimately negotiated as best our country could from its traditional position of weakness. Thus the headline and press-conference after the State Dinner will showcase two leaders, each of them smiling, each putting the best face on what was agreed, neither of them surprised. Traditional weakness? America? Yeah, these are two great nations, improbably joined at the hip, China dependent upon exports, America, imports and financing of our national debt. The United States moving from largest investor nation to largest debtor nation is a big-time weakness. The value of the dollar has dropped like a rock, 30% internationally during these past six unfunded years of war and tax relief. At any rate, neither country comes to this meeting entirely comfortable with the obvious and necessary see-sawing priorities. Decades ago, we told China it had to become more Western, embrace Western culture and develope a capitalistic worldliness to raise the standards of their impoverished people. So, they took the American model, undervaluing their currency (something we once did with slavery), setting their worker-class against their agricultural class (a feat we accomplished with mechanization), causing enormous environmental damage (as did our lumber, industrial and mining industries) and wrapping the entire package in dodgy legalities (as with our union-breaking and waves of immigrant labor). Now, as we look at what China has wrought in our likeness, we find it’s not as pretty a picture as we would like it to be. Nor has it found a way to provide the cheap goods Americans demand without takingour jobs and ignoring copyrights. As Ann Landers always said, there ain’t no free lunch. As a practical matter, we are helpless. The bill sponsored by Senators Charles Schumer and Lindsey Graham to impose a 27.5 percent tariff on imports of Chinese goods, until they see certain things our way, won't happen. It plays well to the voters, but is prevented by China's membership in the World Trade Organization. We are members as well and the WTO precludes members from imposing unilateral tariffs on other members. Pffffttt! Sorry, Charlie and Lindsey. We are further made helpless because China holds so much of our paper debt. We’re at an all time high right now in taking on that debt and there aren’t that many players in the let's-finance-America game any more. The oil-rich nations are tending toward Europe and Asia at the moment, watching Iraq and Iran with a wary eye. So it seems this dance of only marginally suitable partners will go on. Until it suits China otherwise. And it will. China will mature as a producer-nation, as Japan and Korea have matured. Their labor force will mature as well, amidst rising wages and the creation of a more abundant Chinese middle-class that demands consumer products on a truly massive scale. And that is the real question mark in future Chinese-American relations, the what happens as their consumer-economy develops and comes into play? But don’t kid yourself that there will be any unexpected ‘breakthroughs’ in two huge economies that are individually unstable for different reasons. And have such potential for mutual economic destruction.